Everyone can sing! Music makes us happy, and singing is the most accessible form of making music. 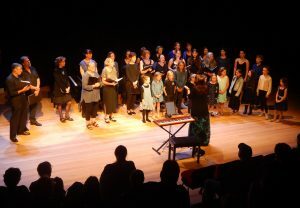 Coffs Con is proud to present our choral ensembles – designed to make you feel good! 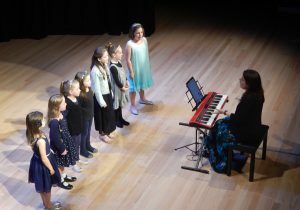 Singing is fun, and children benefit enormously from the chance to meet new friends, improve their musical ability and boost their self-esteem and confidence. The choirs perform at the Con and other venues through the year. Love singing? Want to develop your musical skills or rediscover your love of music? Come and join the Con’s adult choir. Experience the joy of singing in three and four-part harmony including a mixture of Contemporary music, World music, with elements of Jazz, Musicals and traditional choral music. Influences include The Pentatonix, the Idea of North and Pitch Perfect. What are the benefits of being in a choir? Making music exercises the brain as well as the body, but singing is particularly good for improving breathing and posture, and reducing muscle tension. There is also evidence that music helps to sustain a healthy immune system by reducing stress hormones. What will I learn in a choir?